Scott Air Force Base is home of Air Mobility Command's "Showcase Wing." An assignment here offers you an opportunity to serve in a very dynamic and Joint Total Force environment. 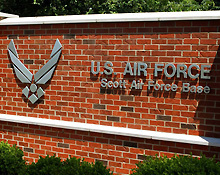 The primary mission of Scott AFB is global mobility. The base commands and controls all logistics of United States military in air, over land and across the sea. Team Scott sets policies and executes all air mobility operations. The installation is responsible for providing United States aeromedical evacuation capabilities, fly operational support airlift in the C-21, and air refueling missions in the KC-135. Scott Air Force Base supplies forces to theater combatant commanders.